NOTE: At the bottom of this page are links to other pages of photographs, etc. This page is a work-in-progress. More photographs are being added as time permits. 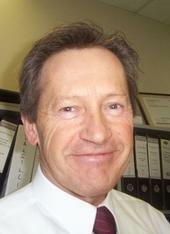 If you have any relevant photographs, please contact me so arrangements can be made to have them shown on this website. 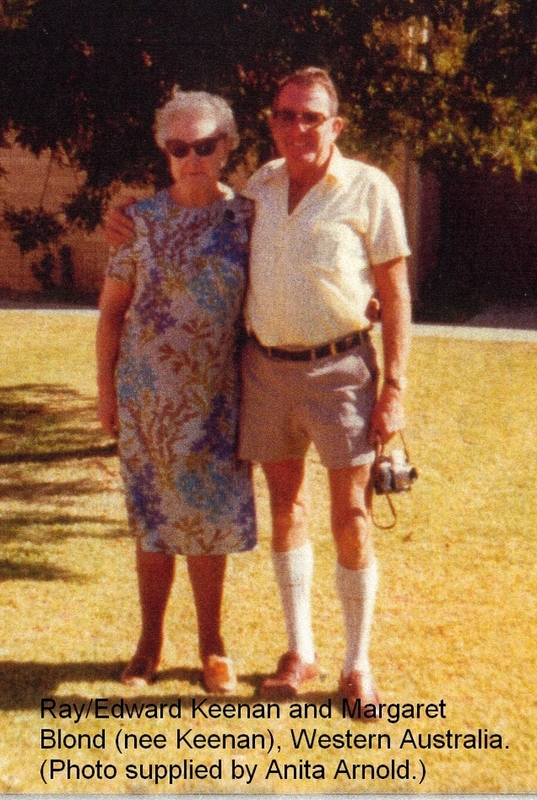 At elderly persons home in Sydney - circa 1925. Her headstone circa 1944. 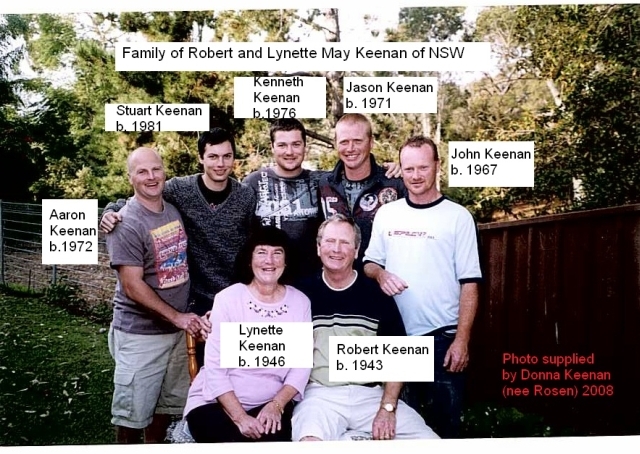 Standing at the headstone are her son, John Keenan, his wife, Emma, his son, John Robert Keenan, and three children including Anita Lovering (now Arnold). 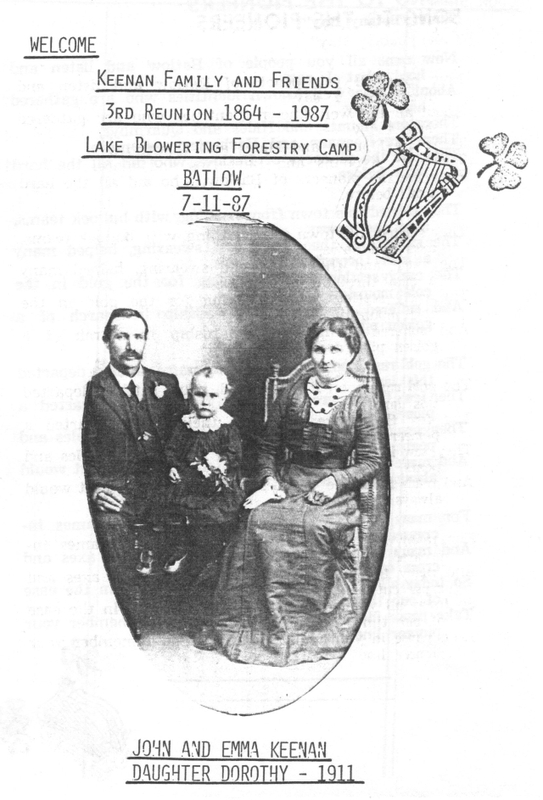 John and Emma Keenan with daughter Dorothy (1911). 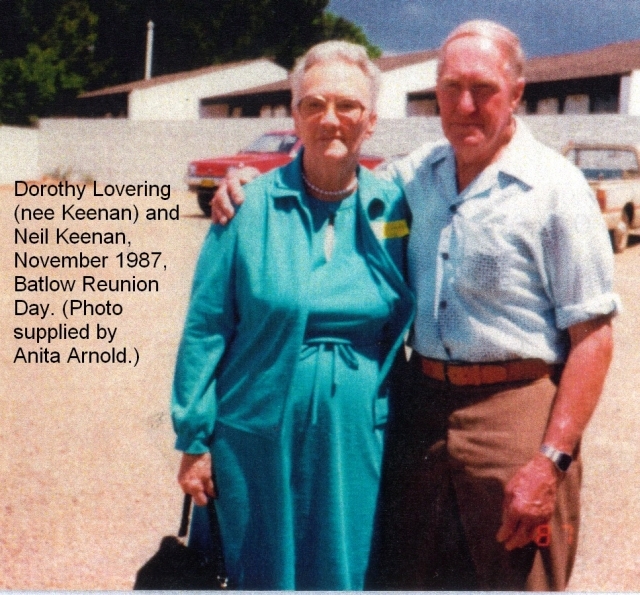 As depicted on the brochure for the Keenan Family reunion at Batlow in 1987. 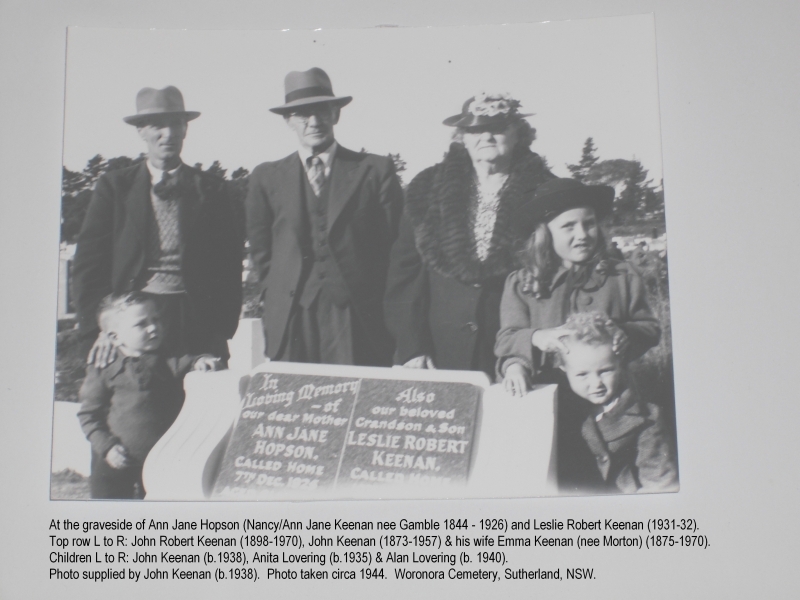 Standing at the headstone of his mother, Nancy Jane Hopson, formerly Keenan, nee Gamble, circa 1944. 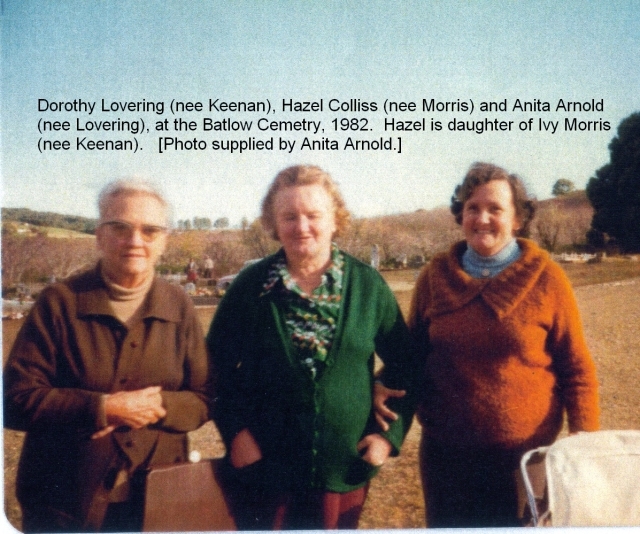 1982 - Dorothy with daughter Anita Arnold and Hazel Collis at Batlow Cemetery. 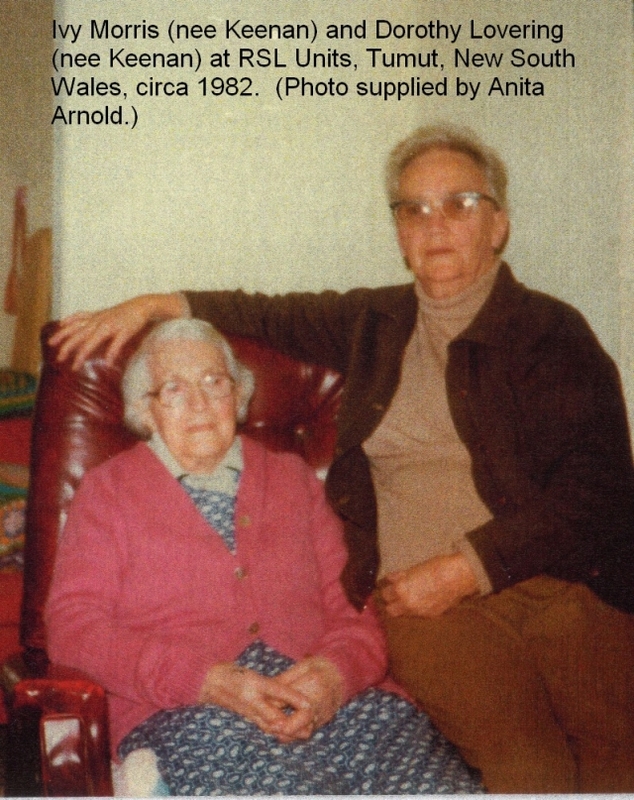 Circa 1982 - Dorothy with Ivy Morris at RSL units in Tumut. With Muriel Langford (nee Keenan) and Ivy Morris (nee Keenan) 1987 at Lake Blowering (Batlow). 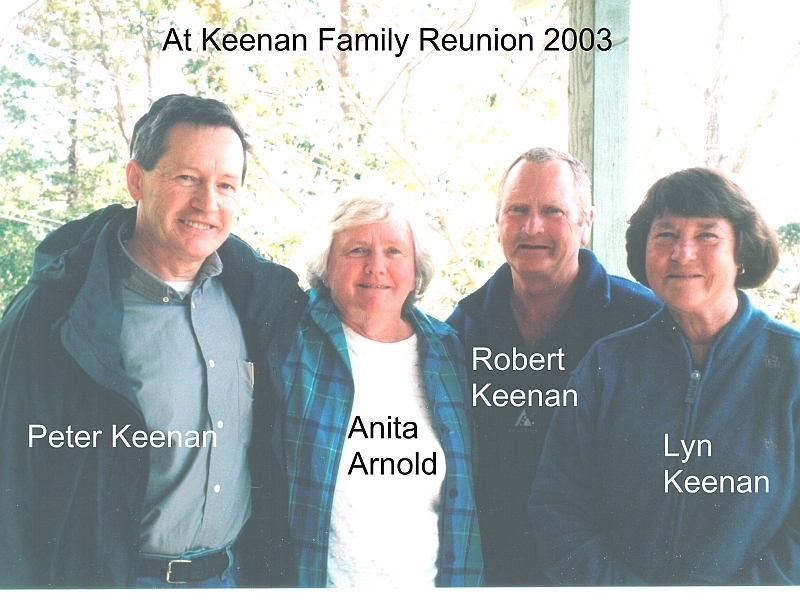 At Keenan Family Reunion in Sydney in 2003	with Peter Keenan, Robert Keenan and Lyn Keenan. May lives in Innisrush, near Portglenone, Northern Ireland. 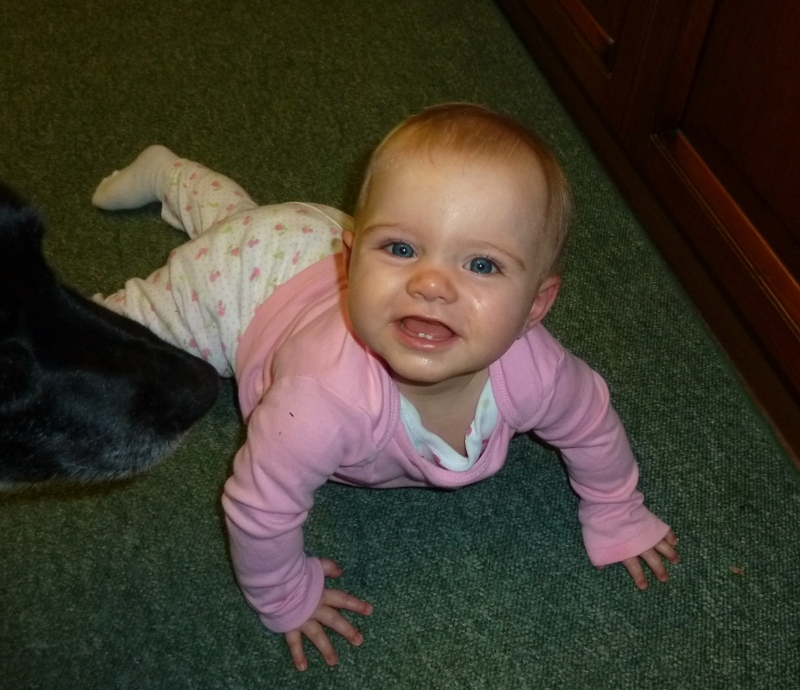 She has been visited by several distant relatives from Australia, Canada and the United States. 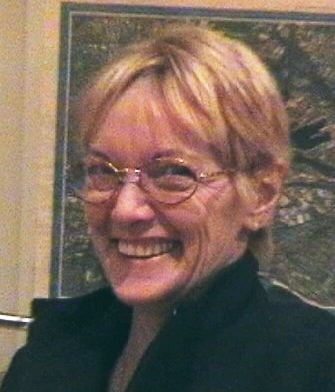 At her home in October 2002. Photo by Peter Keenan of Australia. Photo taken in the 1970s in Northern Ireland, and was supplied by Jack Harkins of Scotland. 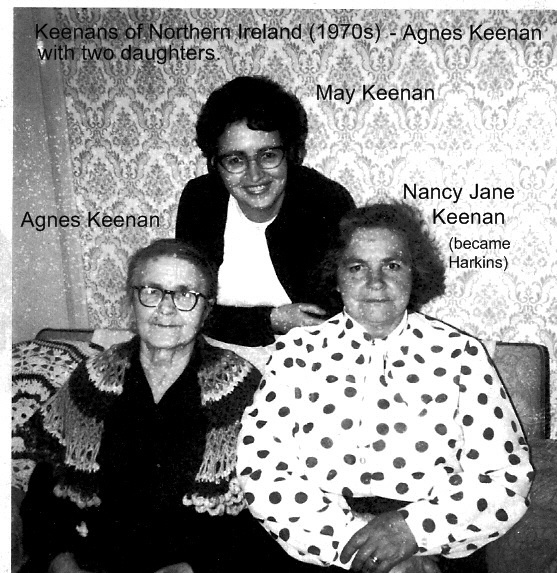 May is with her sister, Nancy Jane Harkins (nee Keenan) and their mother, Agnes Keenan. 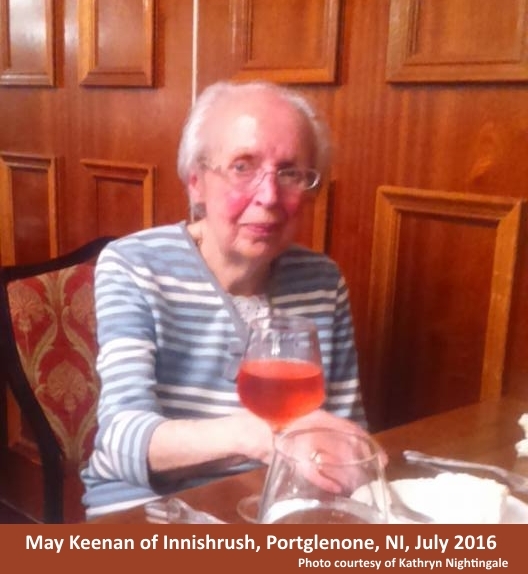 At Tullyglass House Hotel, Ballymena, Northern Ireland, in July 2016. At lunch with her grand-niece Kathyrn Nightingale. Photo from Kathyrn's Facebook page. 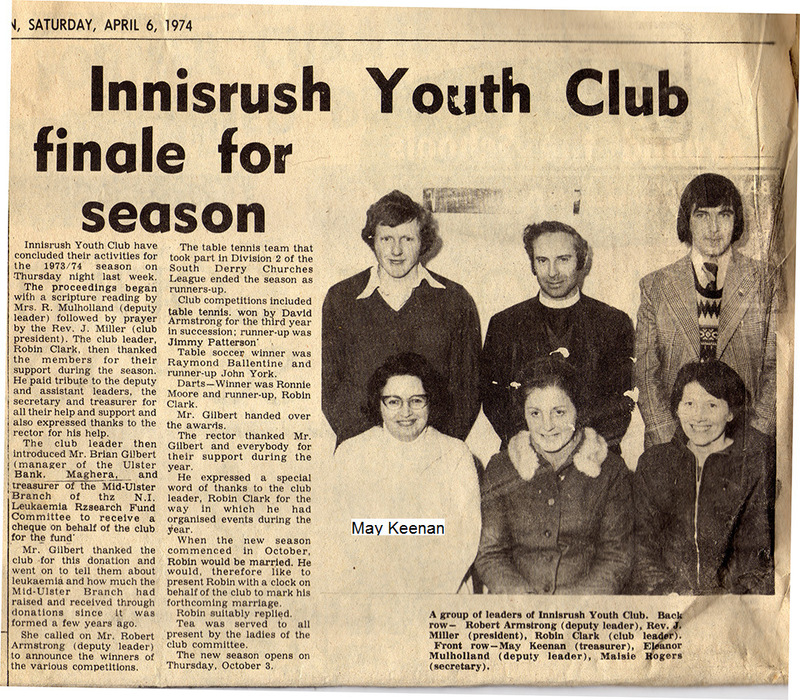 As Treasurer of the Innisrush Youth Club in 1974. 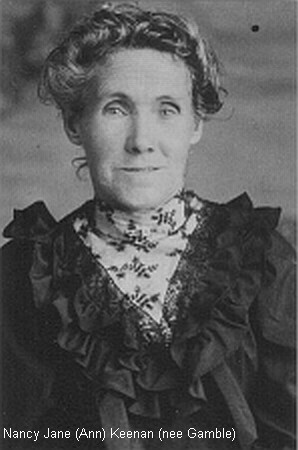 Sister of May Keenan. See above. See entry above. 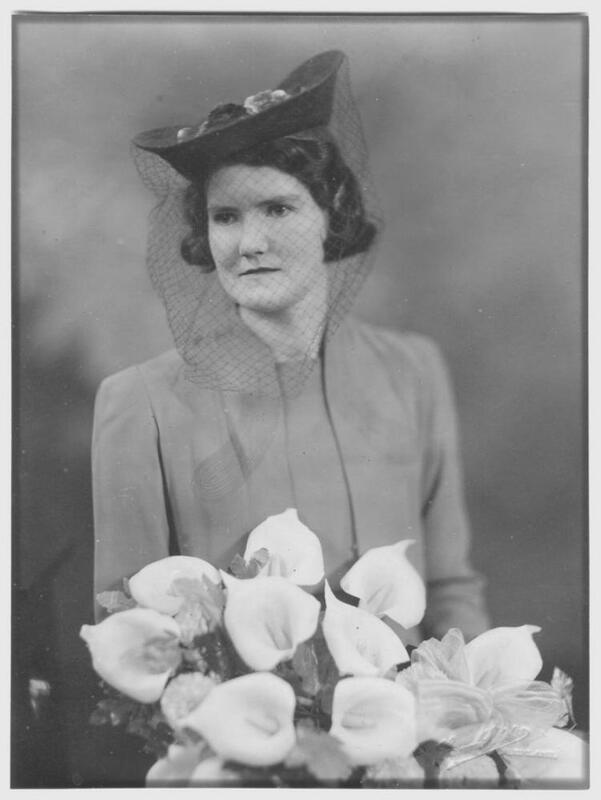 Mother of May Keenan and Nancy Jane Harkins. See above. Robert Keenan in UK navy uniform. 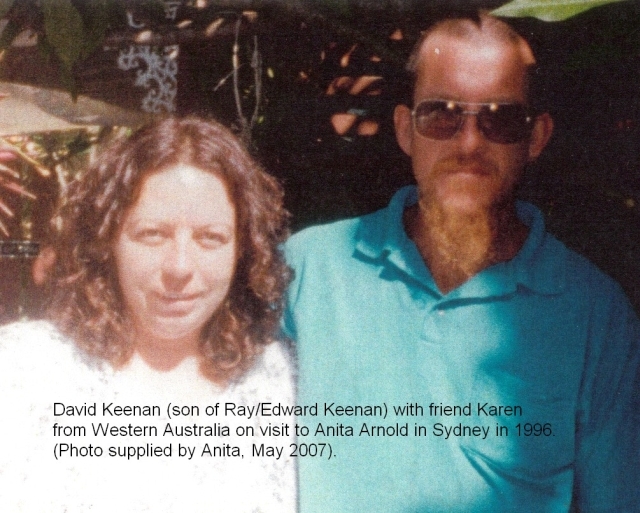 May Keenan's brother. 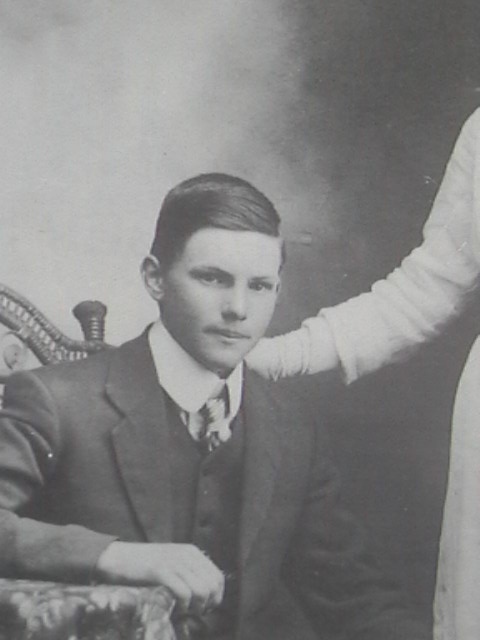 Uncle of Jack Harkins of Scotland (who supplied the photo). 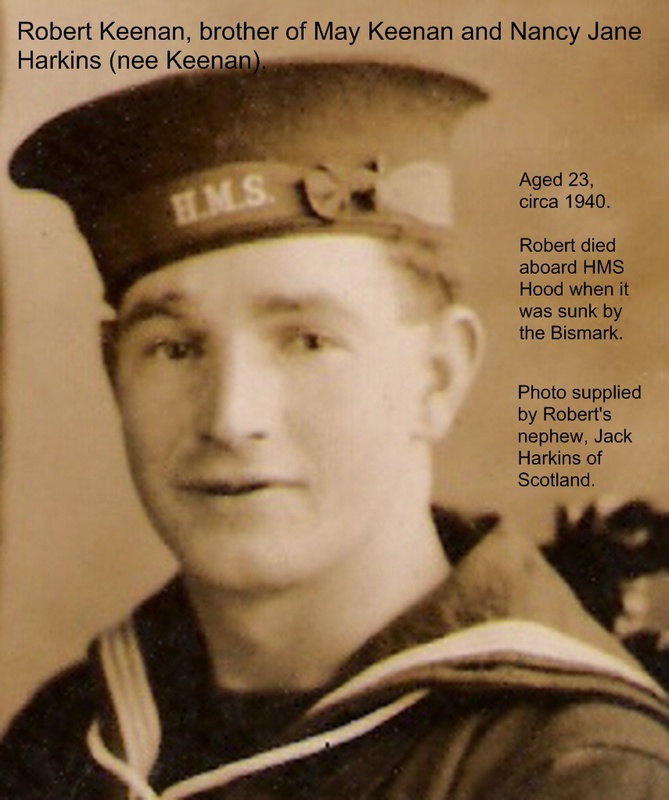 Robert died when the HMS Hood was sunk In WW2 by the Bismark. 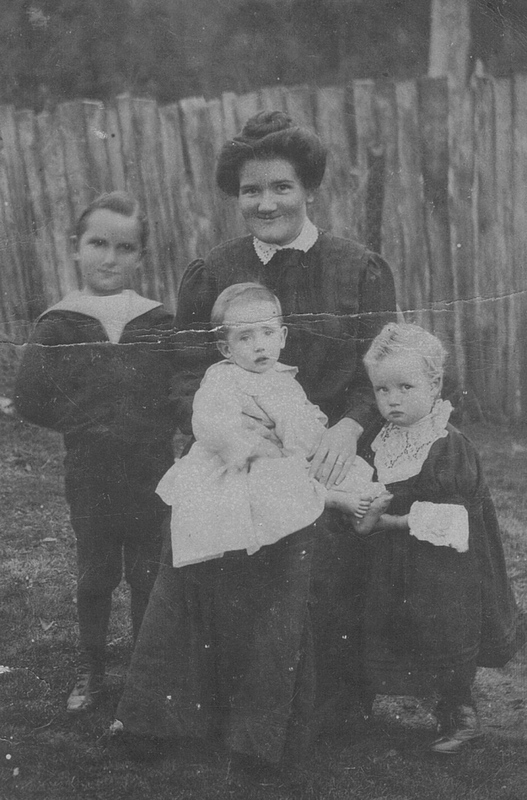 Florence with children, Fred, Hector and Grace, in 1908 at Batlow. First home of Florence and James Keenan of Batlow, circa 1930. Click once here or here. 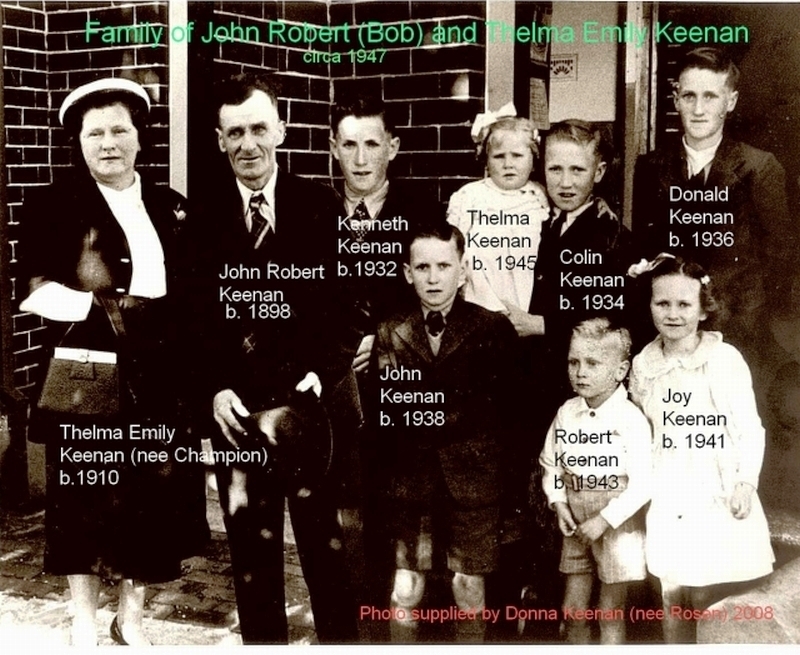 Top row: Stuart Keenan (son of Aaron Keenan), Edna Keenan and Muriel Keenan. 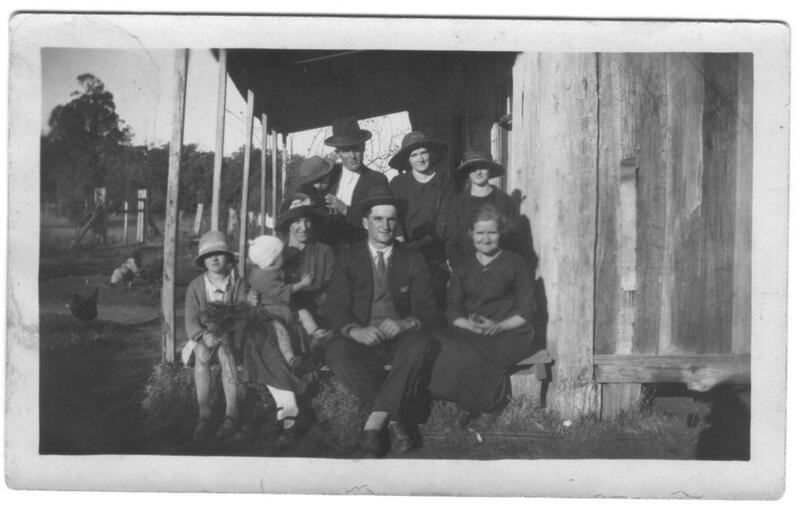 Bottom row: Eunice Keenan (Stuart's wife) holding baby, Frederick Keenan and Florence Keenan. 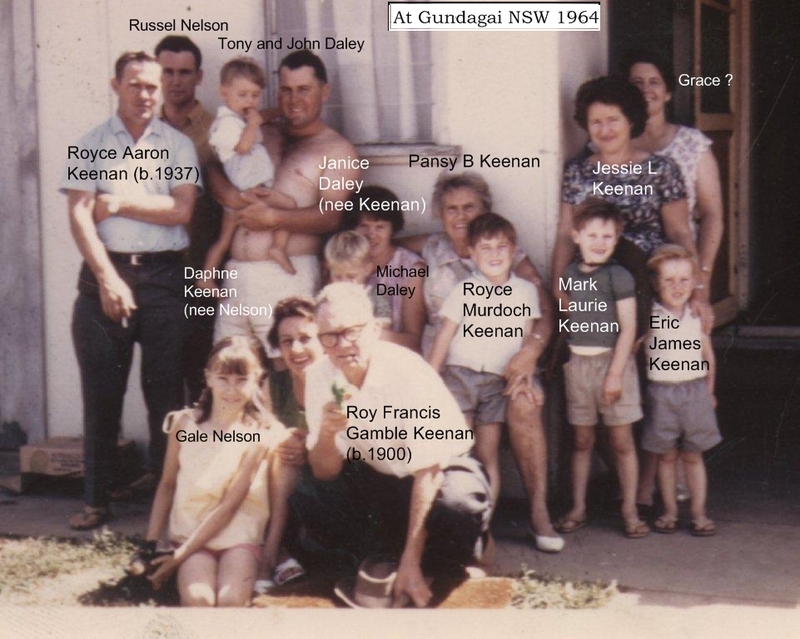 Names of children not known, but two could be Neville Keenan and Bede Keenan. 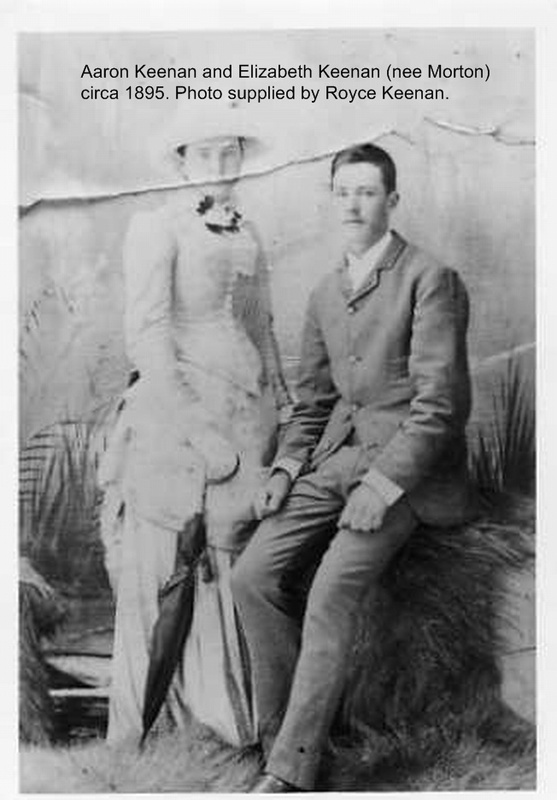 With wife Elizabeth Keenan (nee Morton) circa 1895. Photo supplied by grandson, Royce Keenan. 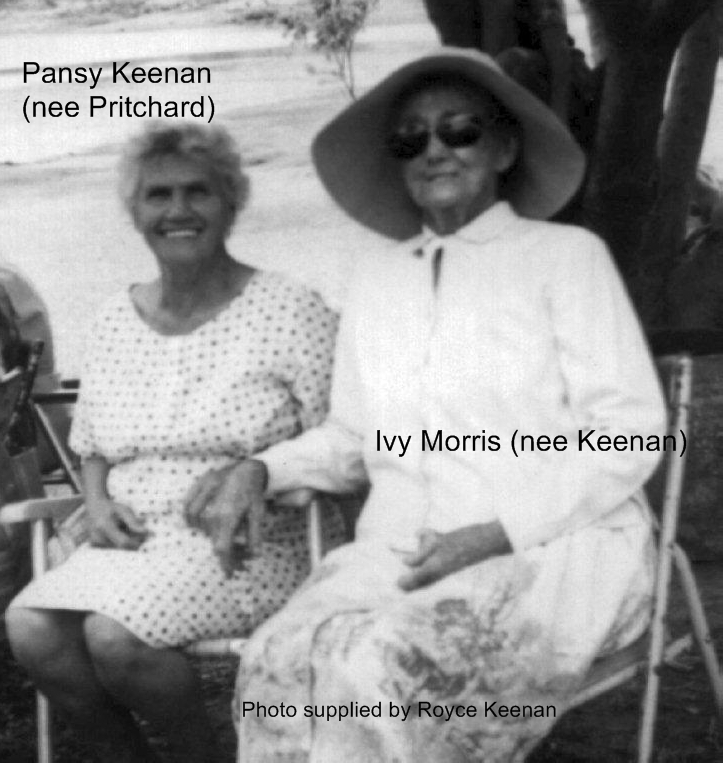 With her daughter-in-law Pansy Bremner Keenan (nee Pritchard). Supplied by Royce A Keenan. 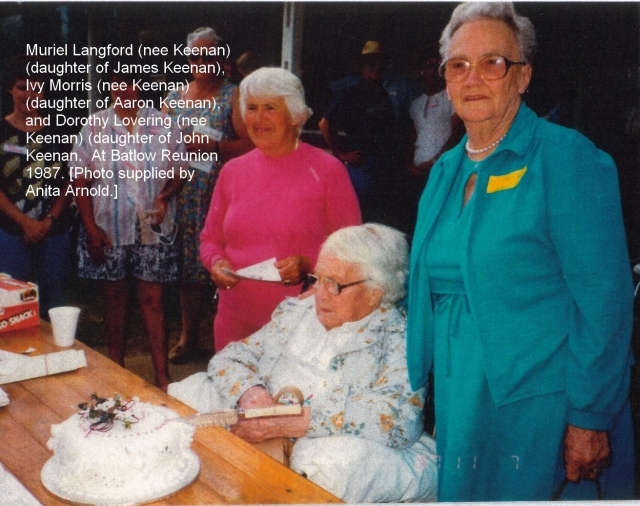 With Muriel Langford (nee Keenan) and Dorothy Lovering (nee Keenan) 1987 at Lake Blowering (Batlow). 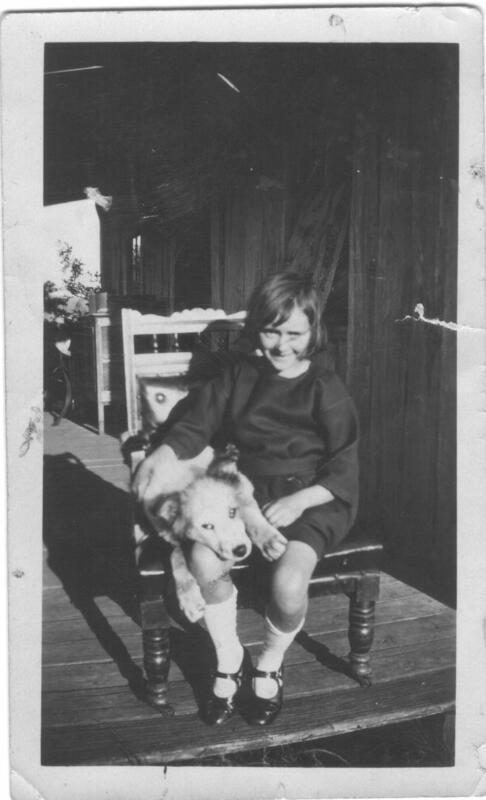 With family at Gundadai, NSW, 1964. With Gale Nelson, Daphne Keenan nee Nelson ,Roy F G Keenan, Royce Aaron Keenan, Russel Nelson, Tony Daley, John Daley, Michael Daley, Janice Daley nee Keenan, Pansy B Keenan, Royce Murdoch Keenan , Mark Laurie Keenan , Eric James Keenan, Jessie L Keenan, and Grace ?. Courtesy Royce A Keenan. At Batlow (circa 1948) with George Keenan and the rest of the Batlow Showground Committee. 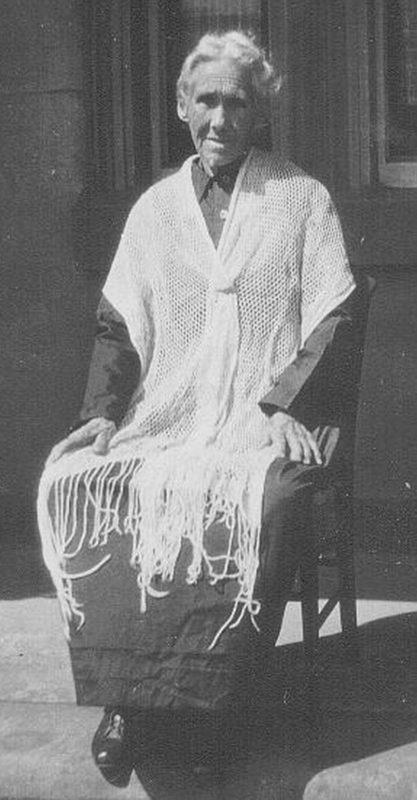 In Batlow - circa 1930. 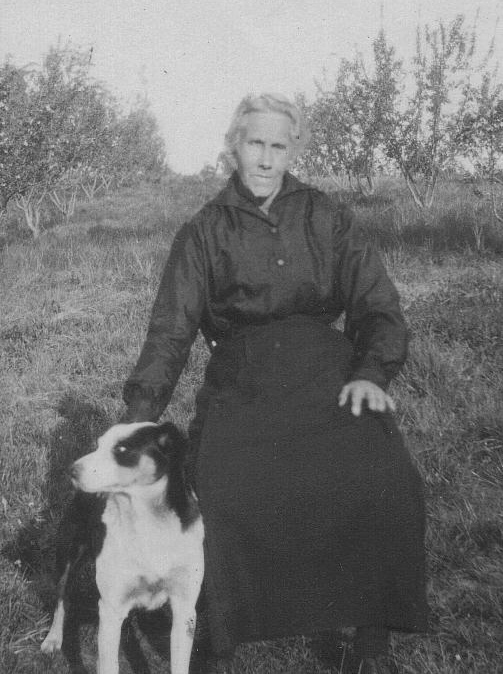 At home of parents, James and Florence Keenan, with dog - circa 1923. 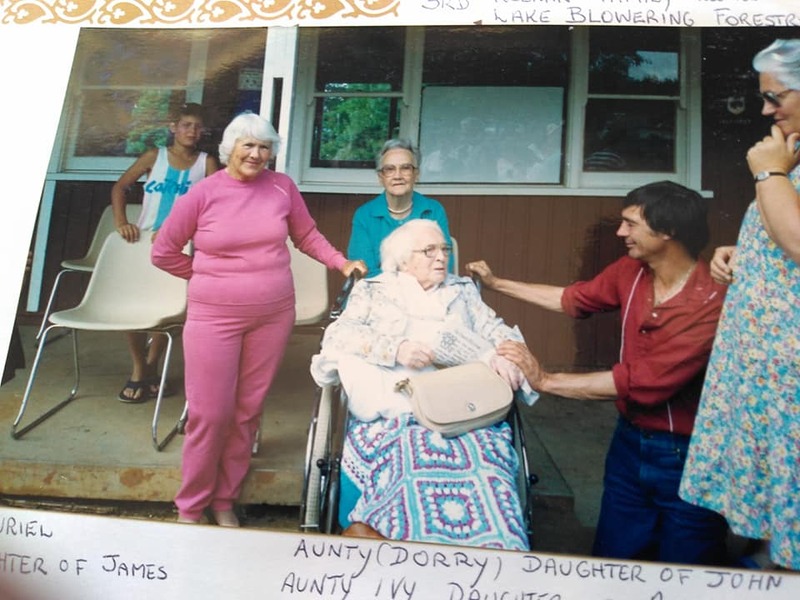 With Ivy Morris (nee Keenan) and Dorothy Lovering (nee Keenan) 1987 at Lake Blowering (Batlow). On wedding day with husband Harry. "Glenone", former home of the Keenan Family in Portglenone, County Derry, Northern Ireland. 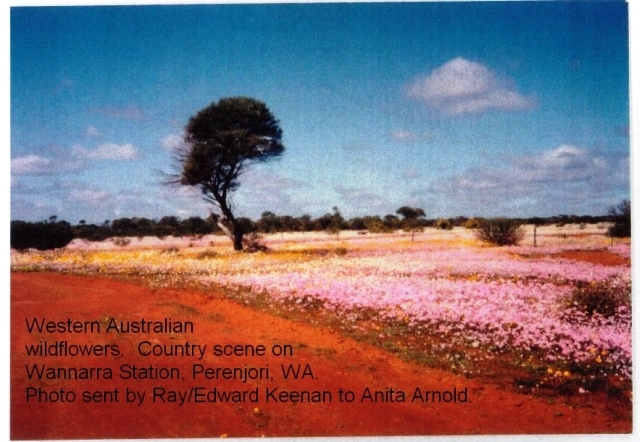 Photo supplied by Anne Waghorn of Western Australia. NOTE: Glenone is also the name of a townland in County Derry. "Glenone" Note: This house was demolished many years ago. 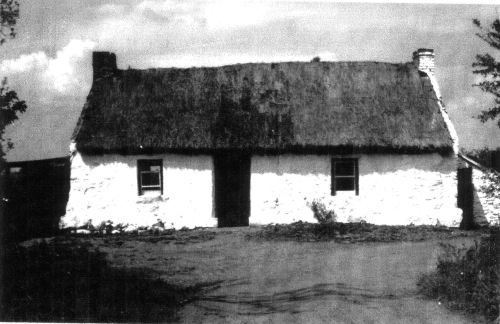 It was located at 57 Clady Road, Glenone. 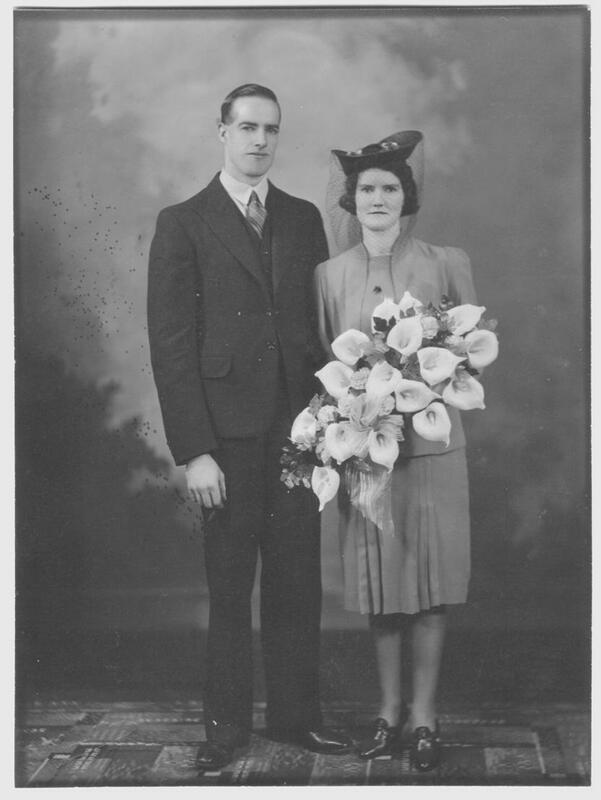 Peter James Keenan, Barbara June Crosby (nee Keenan) and Geoffrey Bruce Keenan. 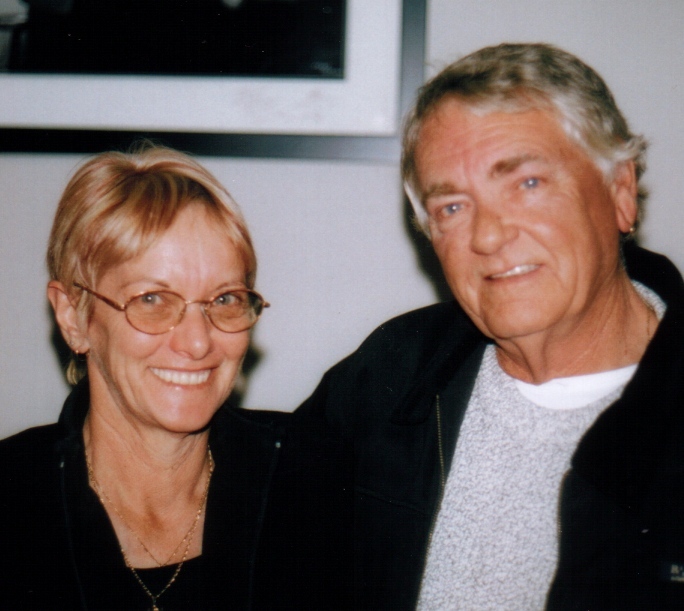 Together in Geelong, Victoria, circa 2002. 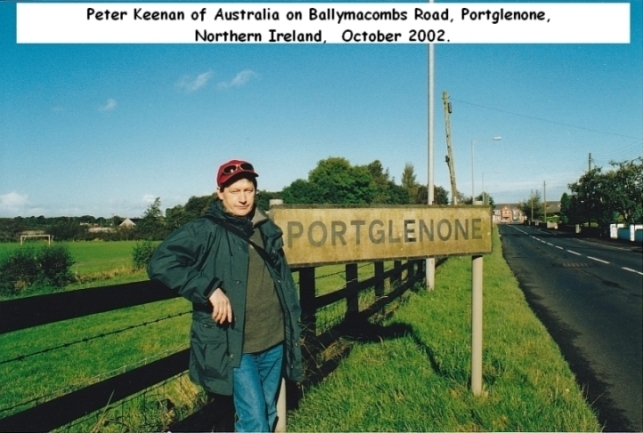 Peter on road into Portglenone, Oct 2002. 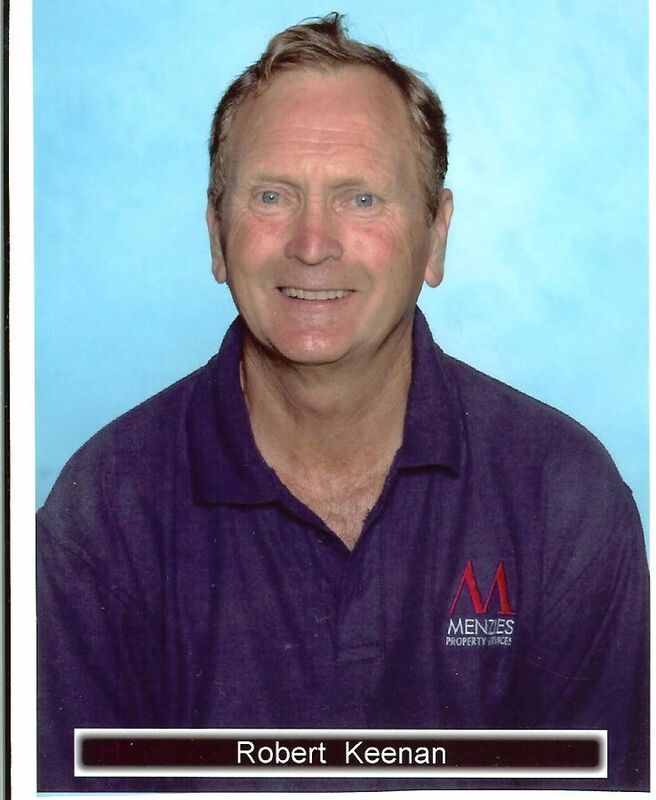 Peter Keenan at work, circa 2005. 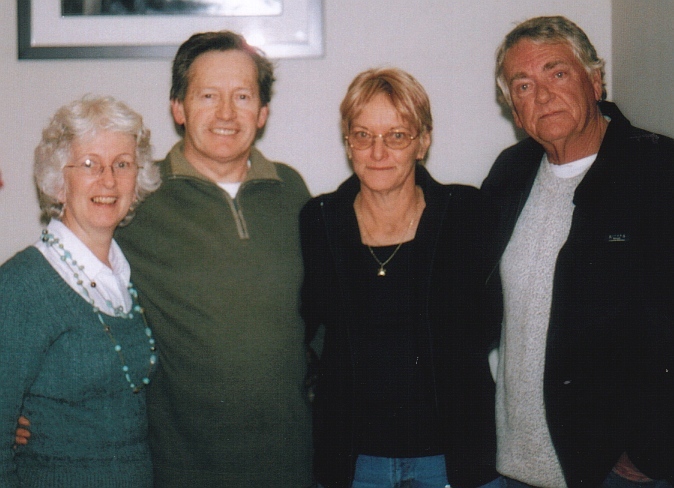 Peter	with Anita Arnold, Robert Keenan and Lyn Keenan at Sydney Reunion 12/10/2003. 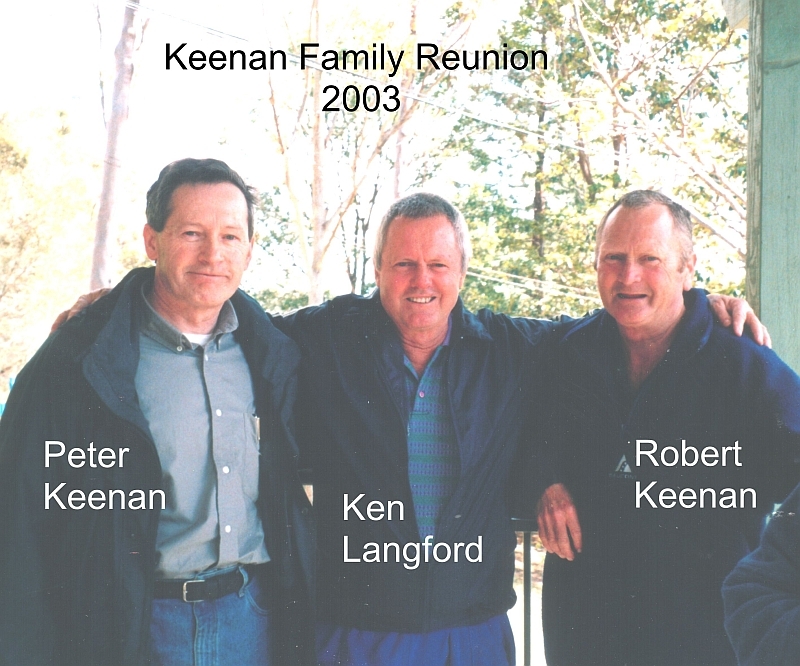 Peter	with Ken Langford and Robert Keenan at Sydney Reunion 12/10/2003. 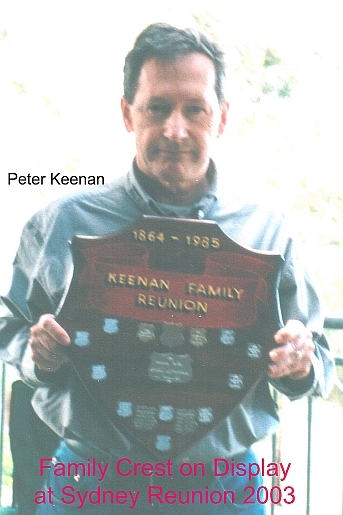 Peter with Keenan crest at Sydney reunion 2003. 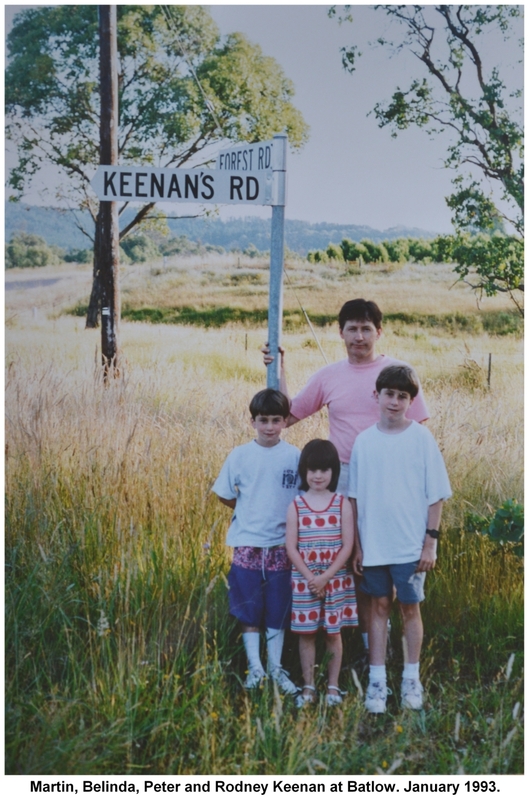 Peter Keenan and children	at Keenan's Road, Batlow, January 1993. 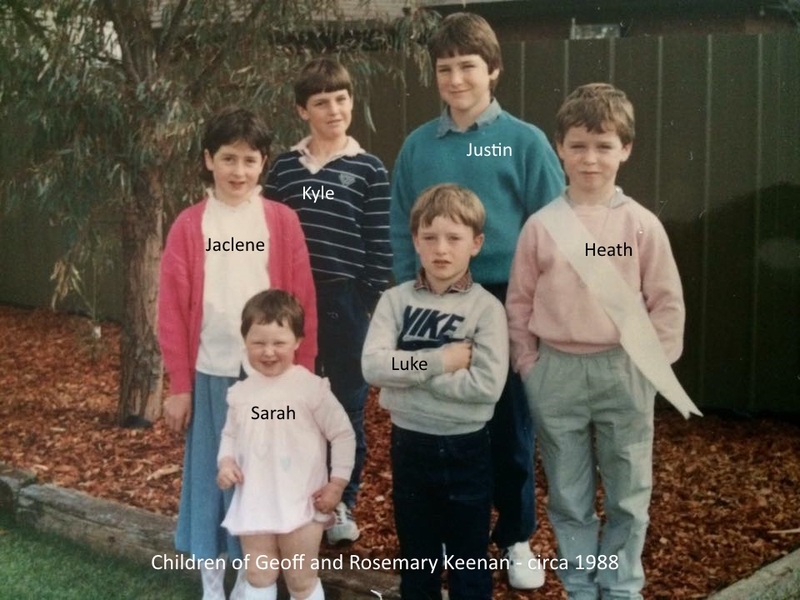 Group photo in Shepparton, Vic, circa 1988. 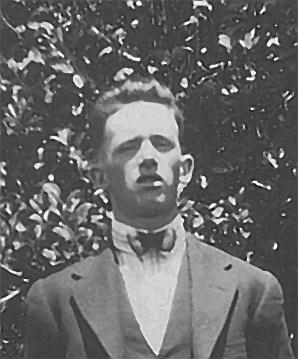 George Aaron Robert Keenan (1894 -1981). 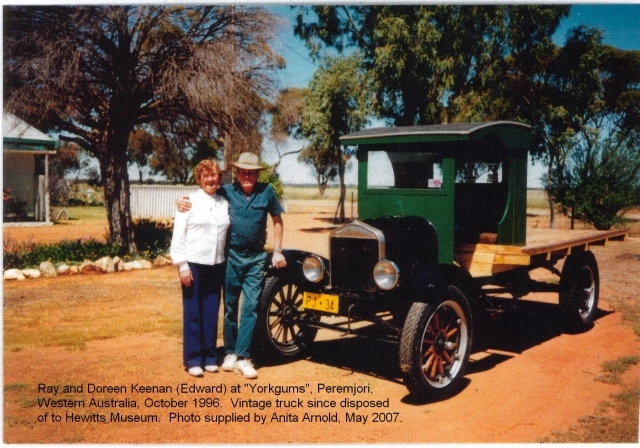 George is the author of the	article on the Keenan family history that appeared in the Tumut and Adelong Times in 1949. 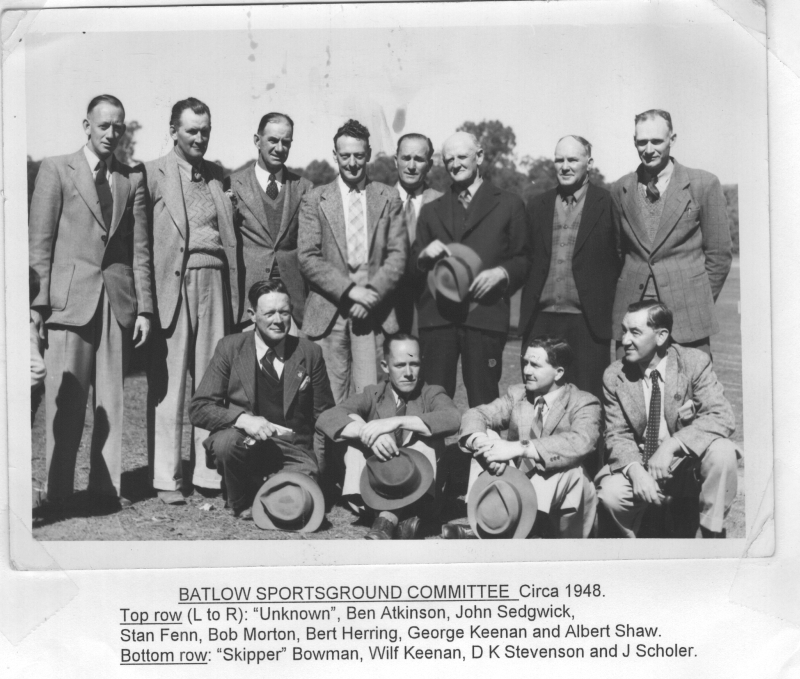 At Batlow (circa 1948) with Wilfred (Wis) Keenan and the rest of the Batlow Showground Committee. 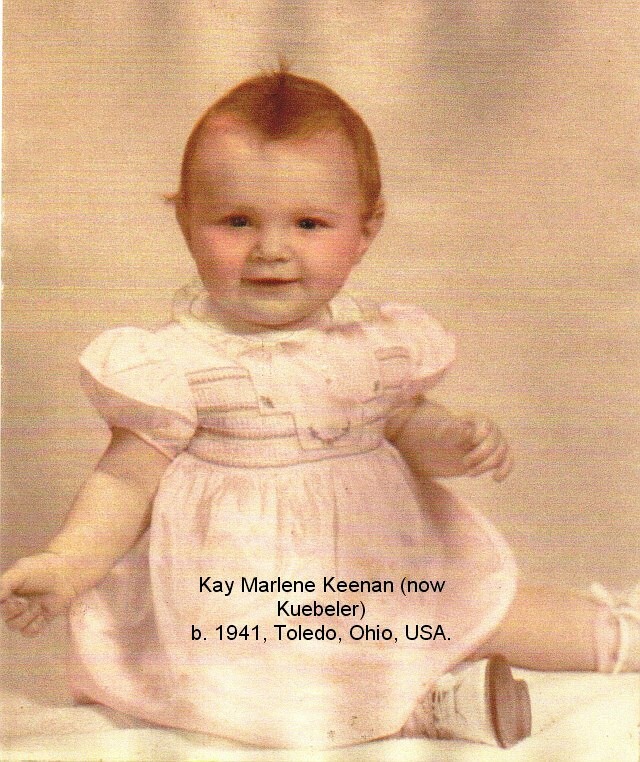 Kay Marlene Kuebeler (nee Keenan) (b. 1941 in Toledo, Ohio, USA. 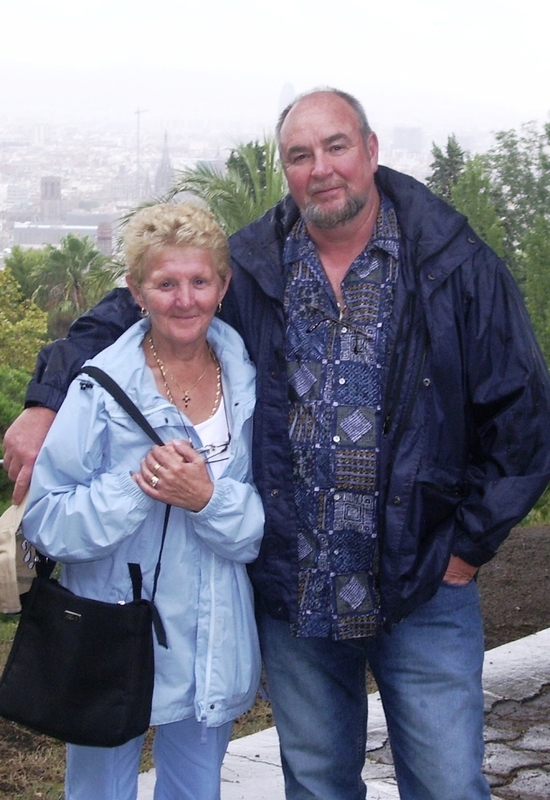 Jack Harkins and wife, Mary, of Scotland. 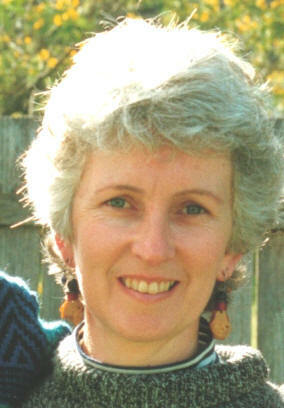 Katie Jane Keenan (b.2005). 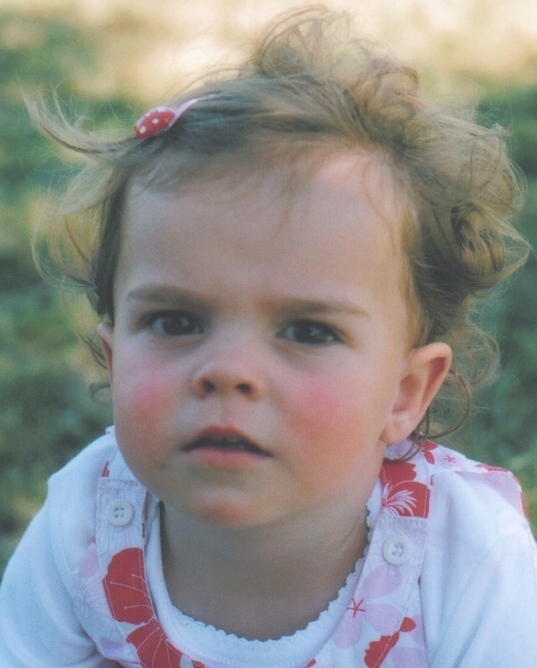 First daughter of Kyle Matthew and Bec Keenan. 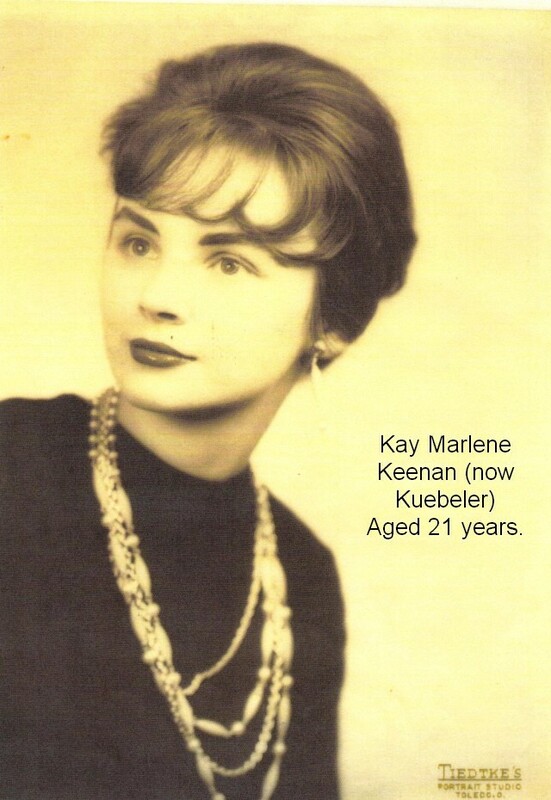 Grandchild of Geoffrey and Rosemary Keenan. At Werribee Mansion, October 1, 2006. 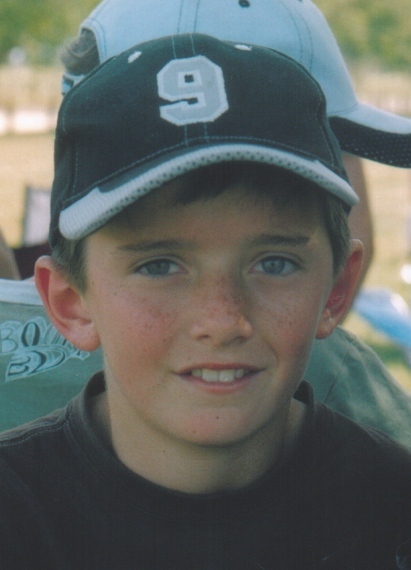 Ethan Jack Keenan (b.2001). 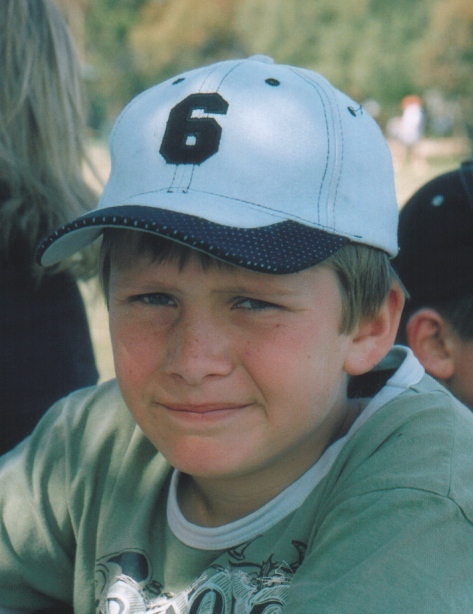 First son of Justin Paul Keenan and Mel. 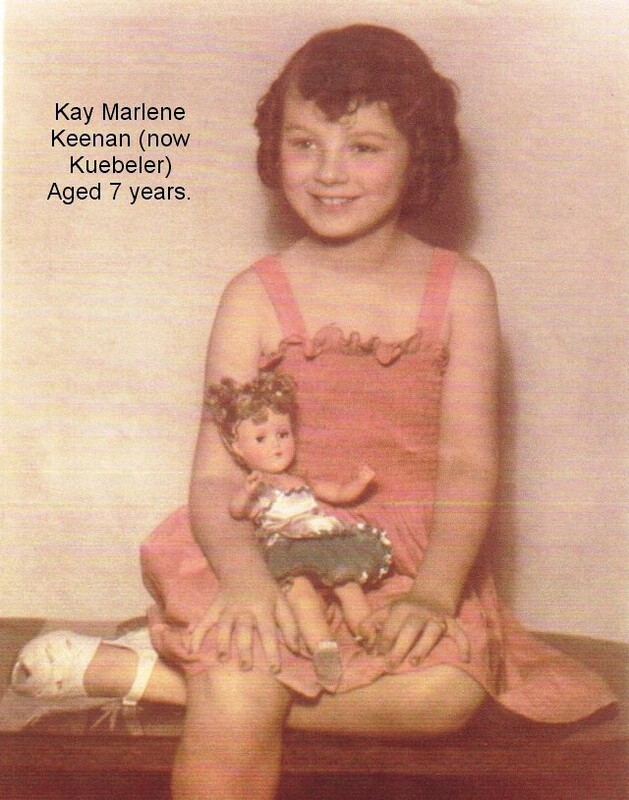 Grandchild of Geoffrey and Rosemary Keenan. 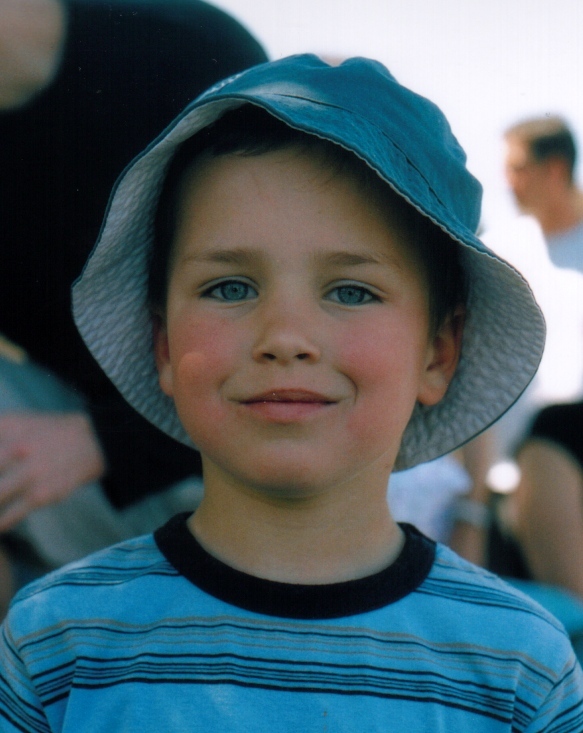 Kye Keenan (b.2004). 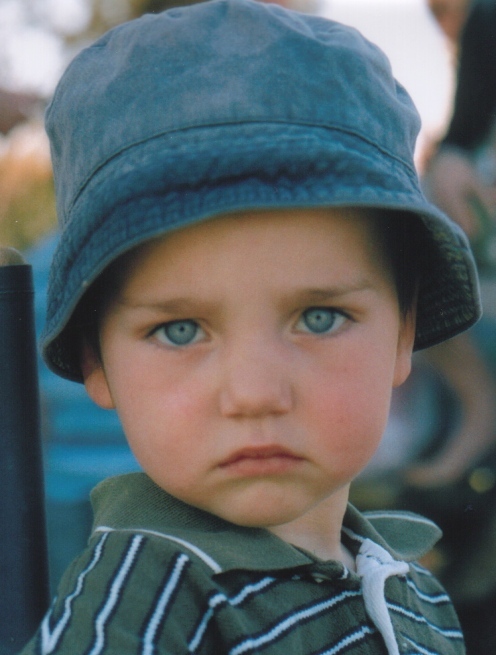 Second son of Justin Paul Keenan and Mel. 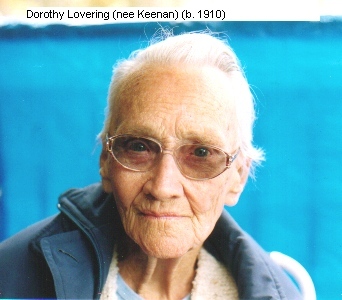 Grandchild of Geoffrey and Rosemary Keenan. The Hosking Kids. 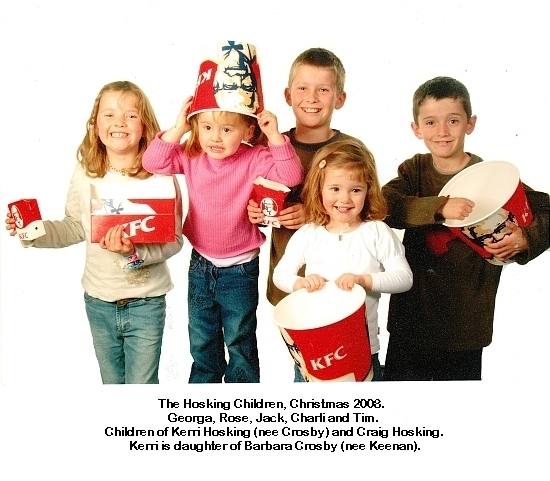 Children of Kerri Anne Hosking (nee Crosby) and Craig Hosking, of Geelong, Victoria, Australia. Grandchildren of Barbara Crosby (nee Keenan) and Rowland Crosby. 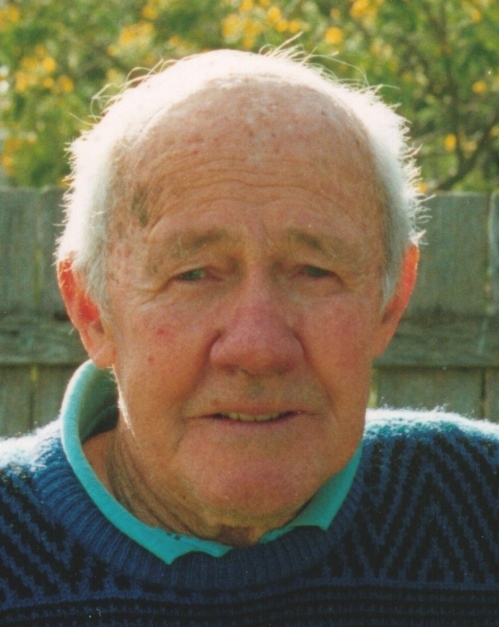 Jack Duncan Hosking (b. 1994). At Werribee Mansion, October 1, 2006. Tim Hosking (b 1996). At Werribee Mansion,	October 1, 2006. All present - Georga, Rose, Jack, Charlie and Tim - as appearing on their 2008 Christmas card. The Crosbys 2010. 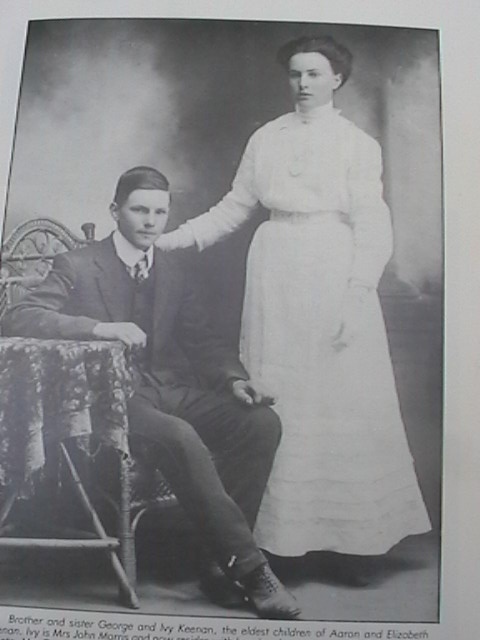 ( Children of Barbara Crosby (nee Keenan) and Rowland Crosby. 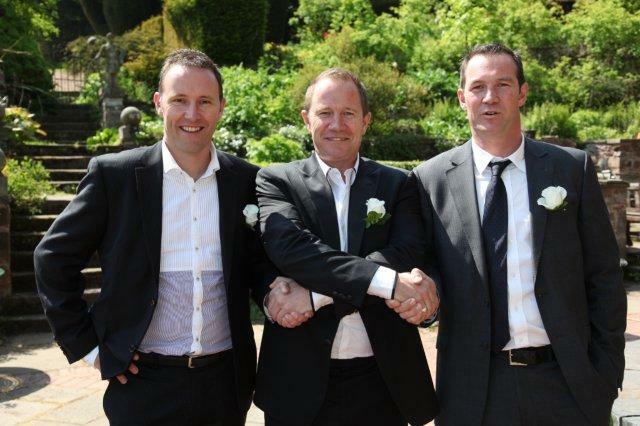 Brothers: Scott, Shaun and Leigh Crosby at Shaun's wedding in Scotland in June 2010. 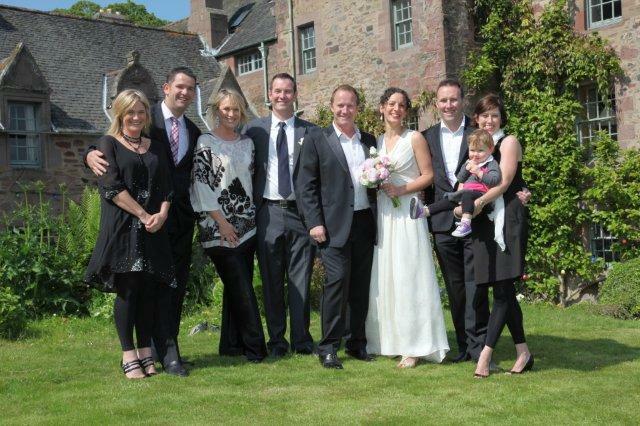 Siblings, husband and wives: From left to right: Kerri Hosking (nee Crosby), Craig Hosking, Kelly Crosby (nee Pomeroy), Leigh Crosby, Shaun Crosby, Angela Crosby (nee Vettraino), Scott Crosby, Samantha Crosby (nee Hinderling) (with child). See separate webpage on this site. the Brian Keenan collection added 22/6/2008. photographs from Jack and Sheila added 25/1/2010.